Hello Tampa Bay, Alex here... For all you concert goers, bring the family out Saturday, May 22 for an enjoyable night of great music and free fun! 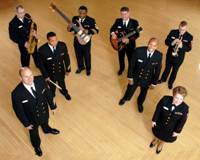 "The Cruisers," the United States Navy Band&apos;s eight-piece vocal and instrumental ensemble from Washington, D.C., will perform a free concert at 7 p.m. on Saturday, May 22 at Curtis Hixon Waterfront Park, located at 600 N. Ashley Drive. As the U.S. Navy&apos;s premier contemporary entertainment ensemble, the Cruisers feature seven of the Navy&apos;s most dynamic performers. The newest specialty unit of the United States Navy Band, the Cruisers are under the leadership of vocalist, Musician 1st Class Leon Alexander. The group takes its name from the Navy&apos;s versatile, flexible, multi-missioned ship - the Cruiser - and the members live up to their namesake by presenting a variety of music including classic rock, rhythm and blues, oldies from the 50s and 60s, Motown favorites, as well as today&apos;s top 40 hits. The sheer energy of their concerts never fails to overwhelm their audiences, who often feel compelled to clap, sing, or even dance along with the group. Local families and concert goers, grab a blanket and come out for a night of lounging in the park and playing in the fountains while you enjoy the variety of music "The Cruisers" have to offer. This is a free event, but parking at the Poe Garage, located at 800 N. Ashley Drive, and at meters along the streets will cost a small fee. Don&apos;t forget alcoholic beverages are prohibited in city parks. Concessions will be available to purchase. That&apos;s it for today, but check back for more information on various events and concerts happening at the various Tampa Florida Attractions.